I can’t believe it is time for the 1/8 Worlds already! I have been very motivated to work hard and have a great result this year. I haven’t been practicing as much as I need to between my races, and my results this year have shown that. 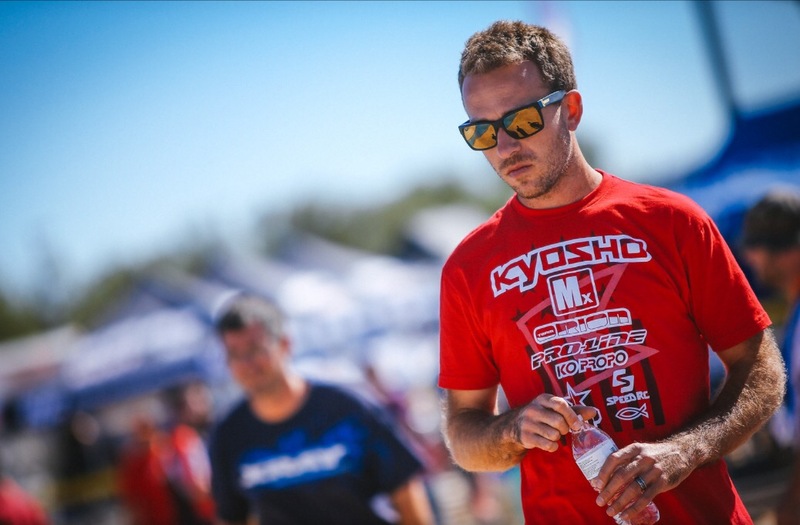 It’s a tough balance, racing multiple classes, trying to have family time, and rebuilding multiple cars before races. I haven’t been happy with my results in 2016, so I decided to put all I had into this World Championship. With the help of my wife, my dad, my friend Gerad, Fastlane Raceway, and Novelty Raceway, I was able to get more prepared than ever. 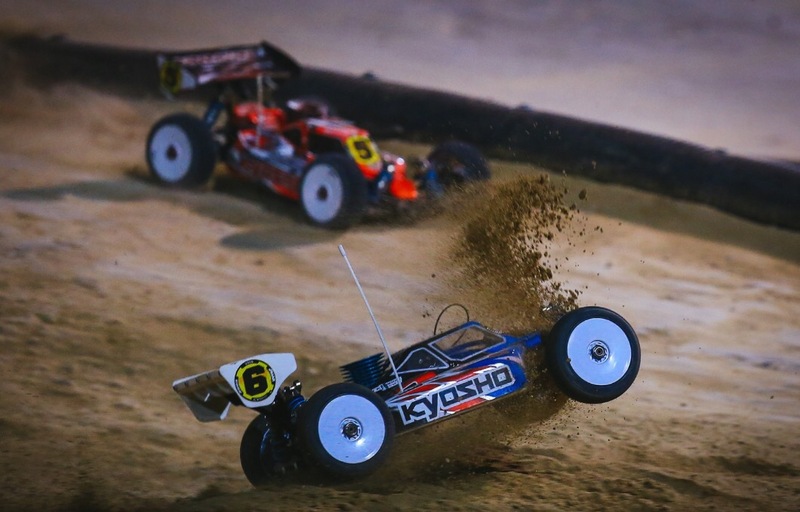 In 3 weeks, I drove 5 gallons of MX Racing fuel, slicked out a whole bunch Proline Racing tires, and completely wore out my Kyosho MP9 practice car, but I was READY. 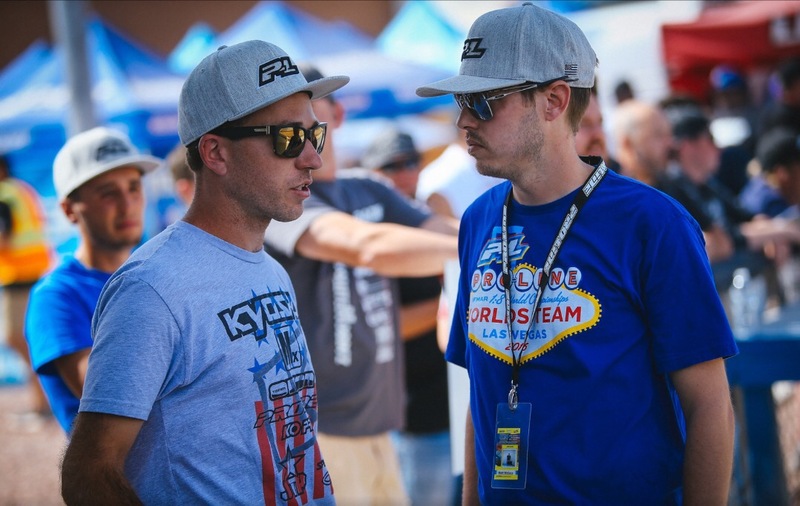 I flew out to Las Vegas on Friday, September 30 and got to watch the pre-race qualifying. There was a special race before the official event started for some racers that were not able to get qualified in prior to the event. That was good because I got to see some cars drive on the track before we had our practice start on Saturday. Saturday was here and I was ready. 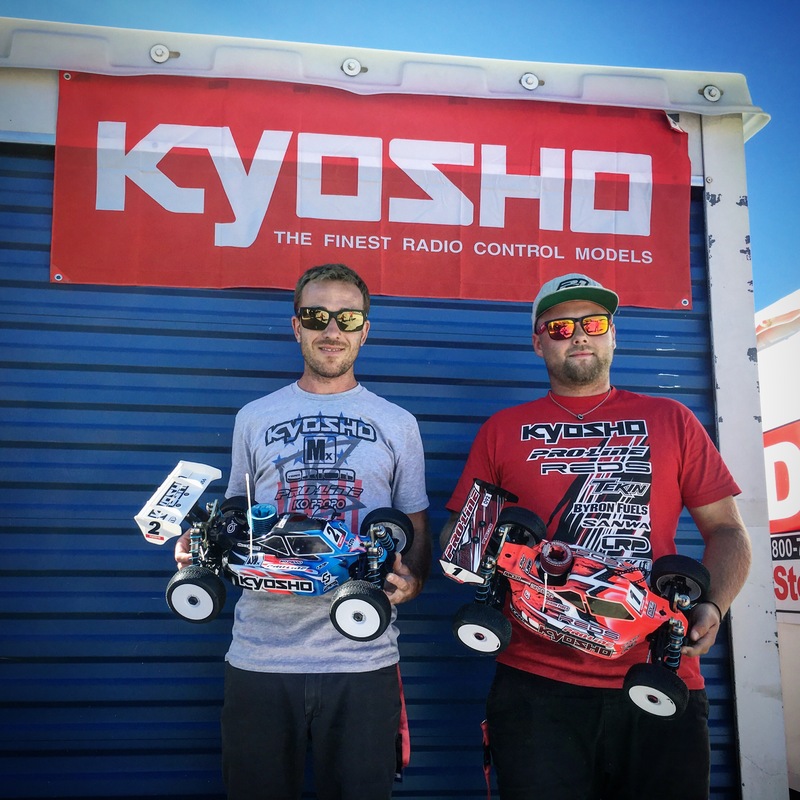 I had my brand new Kyosho MP9 TKI4 all ready to go, two perfectly broken in MX Racing engines ready to go, and my Proline M3 Holeshot tires ready for practice. We would have registration in the first half of the day, then just get one 10 minute practice session to end the day. First time hitting the track and I felt pretty good out there, the track was really fun to drive and had a good flow. I had watched a TON of laps already, so I had all my lines I wanted to use. My setup I started with felt great too, so it was a good start to the event! After the round was over, the media brands posted the top 3 consecutive times and I was sitting on the top. That doesn’t really show or mean anything, but it was still a great way to start the long event! Monday we would actually get on the clock for real and have official Seeding Practice. 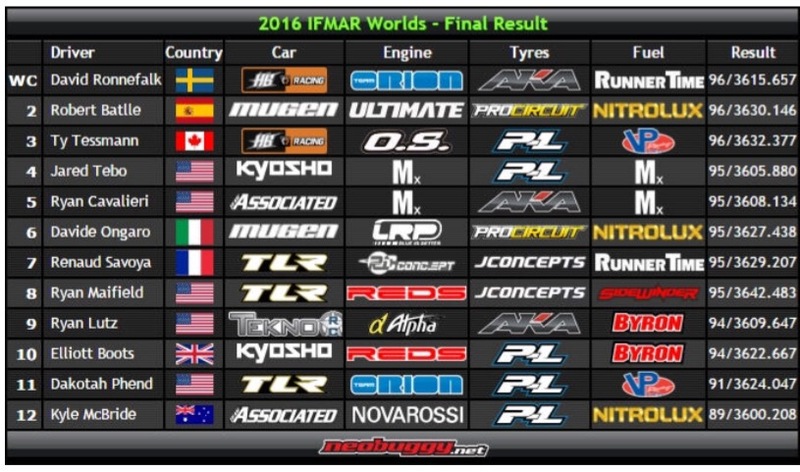 Normally IFMAR World Championship seeding takes the second half, 5 minutes not timed, then 5 minutes timed, and uses the full 5 minutes as your seed-time. The IFMAR committee decided to change that to just taking your best 3 consecutive laps during the full 10 minute run. I was really looking forward to running 5 minutes on the clock, as that would be more accurate to qualifying, but I was more excited to just be officially on the race clock now. P1 I went back to my original set of shocks and made a rear roll center change. My car was feeling the best it had felt so far in practice. I wasn’t able to get 3 super clean laps together, but I was 4th fastest. P2 was pretty similar and I ended up seeding 6th overall after both practice sessions. I was pretty happy with that and was excited to get qualifying started. That night was also opening ceremonies, which is always special to see all the different countries that come out to support the racing industry. This year seemed to have the most countries I have seen at a World Championship event, with 42 countries represented! Qualifying is FINALLY here!!!! The faster heats were up first and I would be in heat 3. The first two heats had some fast times, but all the drivers had some mistakes, so I felt the TQ position was in reach if I had a clean run. I was a little timid as I felt pretty nervous during the first couple minutes, but then I got into my groove and drove the second half pretty well. 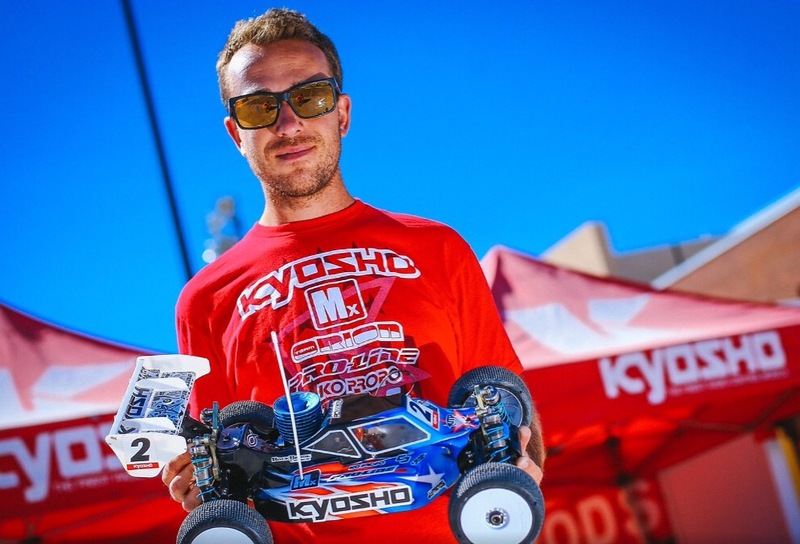 Elliot Boots (my Kyosho teammate) was also in my heat and lead most of the race, taking the win and the TQ. I was just a couple of seconds back and took the 2nd spot for the round, so I was super happy. 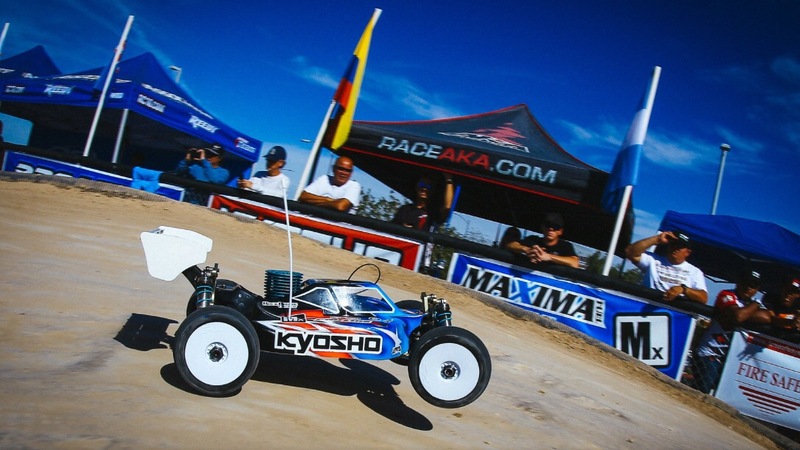 Great start for me, Kyosho, and Proline as both Elliot and I run the Kyosho MP9 and Proline tires. I was happy to get a clean first run and was excited for Q2. For Q1 I ran Proline M3 Holeshots and they felt really good, but some drivers were running the M4 compound. For Q2 I ran Proline M4 Electroshot, but I think it was a mistake. I didn’t feel as comfortable towards the middle and end of the run. With the track being watered for every heat, I started out faster than in Q1, but wasn’t able to finish as strong. I still had a decent run, no crashes, but many small mistakes, ending up 7th for the round. Day two of qualifying and my Dad was able to come out and would be there for support the rest of the event. I have great support out here, which is really awesome, Joe Pillars (my normal pitman), Rhys Herd (from the UK) as my helping hand on my car, and now my Dad! 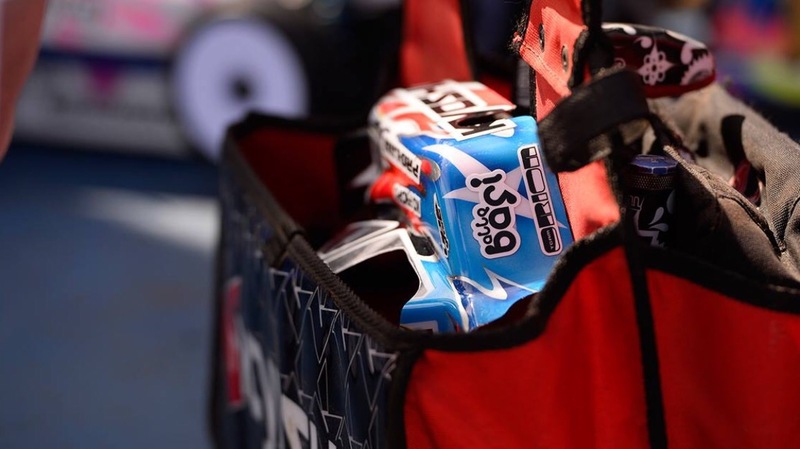 Switching back to Proline M3 Holeshots for Q3 I was excited to get out there. Just getting out there and making no mistakes was my plan, and I was able to do it! 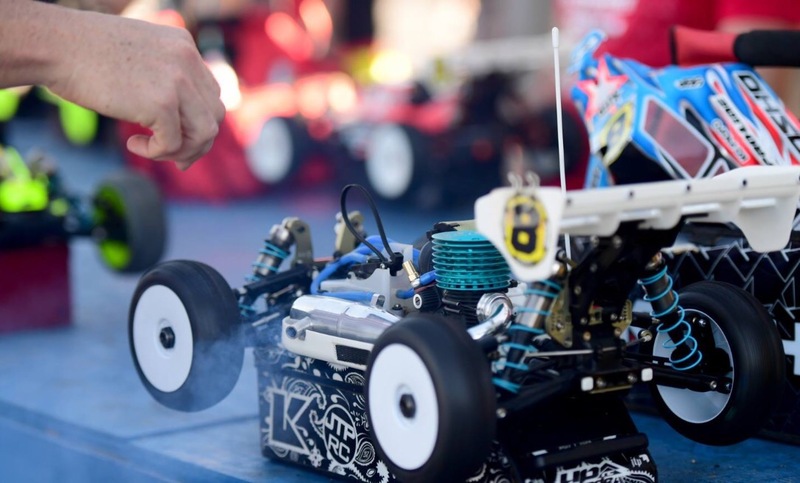 My car felt great, I was comfortable with my tires, and just drove my own pace, which gave me the TQ, that felt awesome! With the heat order changing each day, 1-18 Q1 and Q2 : 7-18, 1-6 Q3 and Q4 : 13-18, 1-12 Q5 and Q6. Q4 for me would be in the evening, after the sun went down and air temp much cooler. I decided to go softer with my shock oil and keep everything else the same. Again I had a great run, keeping clean for the whole qualifier and getting 2nd for the round. Not sure if I liked the softer car, I would go back to my standard shock oil for Q5. With a TQ, 2nd, 2nd being my best three scores, I knew If I could get a TQ in Q5 it would really help me in securing the overall TQ position. All night I was thinking about doing the entire 10 minute qualifier without stopping for fuel. 99% of the drivers were having to make fuel stops, only a very small group of drivers running the 11-11:20 needed to make the whole run, counting the out lap, and then we were ending around 10:25-10:30. My fuel mileage has been good, and the track was getting rougher, which means you can use less throttle and still get fast lap times. I decided to risk it and go for it, I was feeling confident. My MX Racing engine was tuned perfect, and I just needed to drive it properly to make sure I finished. My pace was really good and my car was feeling perfect. After half the qualifier, I was 8 seconds ahead of the current TQ pace held by David Ronnefaulk and feeling great, my goal was to beat the TQ by 5 or more seconds, as a pit stop was 4-5 seconds. I wanted to show I had spped and good fuel mileage! With a few laps to go, I caught a lot of traffic and was getting slowed down, then with two laps to go, a car crashed right in front of me. I hit it, then another car hit the back of me, sending me off the track, but I recovered and got back on without crashing. Starting the last lap, I was only 1 second ahead of the TQ, thankfully I had a clean final lap and took the TQ by 1.5 seconds! 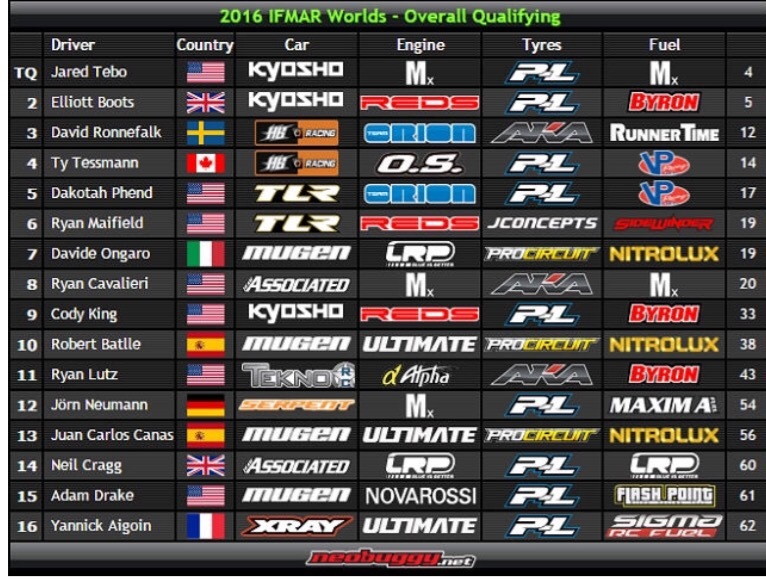 Elliot Boots would not go better than 5th, so mathematically I had locked up the overall TQ after Q5! I was really happy with my car and my driving, but bummed with the traffic issues and having it be that close for the TQ. My MX engine and MX fuel was perfect and I was happy I made the run on fuel. I drove very easy, never pulling full throttle during the entire run, and I didn’t have much fuel left after the qualifier. For Q6 I wanted to go out and drive more aggressive and make a fuel stop. I also decided to test a few setup changes I had planned on testing at some point. I went to softer springs and softer diff oils. I had some early mistakes, having to get marshalled (first time in all qualifying) two times in the same lap, costing me 9 seconds. I got back into my groove and finished strong, but would have my worst round of qualifying, 8th for Q6. Wasn’t too happy with how the day ended, but was really happy to get the overall TQ, my fifth IFMAR World Championship TQ, and the second time for 1/8 Buggy! Friday we would have an off day as they would run the lower finals. I would show up to the track a little after lunch and get all my work done on my car. Nothing too serious, changed all my diff oils back, changed my shock springs back, checked over the car, everything looked great. It was fun to watch some of the later races and see the drivers battling to transfer into Saturday’s finals. The track was also making a lot of changes, with the races all 30 minutes, the track was getting much less water and getting rougher and rougher. There was a HUGE hole developing after the center double jump, which played a big part in all the finals. All the talk around the pits was TIRES …. what tires to run, what tires have good traction and don’t wear out to fast. The track looked to be getting more slippery, but also tire wear was coming up. Saturday is here, can’t believe the week has gone by already, a World Champion will be crowned today!!! I don’t really enjoy the 1/8 Worlds format with all the extra time after qualifying before the finals. There is just so much time to think. They were not starting the first finals untill 11AM, they wanted the main Final to be under the lights, so we had even more extra time. I wanted to have some fun and clear my head, so my Dad and I decided to go check out a car show and then go to a RC flying field to check out some large-scale contest they were having. Both were pretty fun and we rolled into the track around 1PM, with my Semi practice scheduled for 2:30Pm. Driver’s were still talking about what tires to use and how the track would feel. Watching a lot of the finals, the drivers that bumped up seemed to have quite an advantage to the other drivers in the final they transferred into. Many drivers were transferring in and then getting the bump spot and transferring again. That normally means that the track is a lot different than how it was in qualifying, because the guys with more track time in the current condition are beating drivers that qualified ahead of them. For my Semi practice, I decided to run Proline X3 Fugitive Lite tires and then test my fuel mileage, as the track was more slick, and sometimes you use more fuel with the extra wheel spin. Fuel mileage seemed a little less, my car felt good, but I was unsure about the tires, I didn’t feel that I had very good traction. I was ready for my Semi, As TQ, I started first in the Semi A, the odd Semi. I decided to run Proline M3 Fugitive Lite as a lot of Proline drivers were using those in the finals I had watched. I got a good start, but then jumped just about a 1/2 car width too wide on the double and hit that MONSTER hole. I didn’t crash, but I got shuffled back to 3rd. I wasn’t too comfortable with my tires and was struggling for traction and a good feeling. I was also getting frustrated, as I felt my chances at a World Championship were going away. David Ronnefaulk was leading the Semi and pulling away, and I viewed him as my toughest competitor for the Title. I was able to pull it together and get in a rhythm, not super fast though, and got a transfer spot, finishing 3rd. The top 5 finishers from both A and B Semi’s go direct, then the fastest 2 overall times of 6th and 7th from each Semi get the final two positions into the main Final. Starting the main 6th, not super great, but I’m in the main Final. I wasn’t happy at all with my tire choice in the Semi, so I decided to go with my gut. Nobody was really liking Proline Blockades, (that’s why I didn’t run them in the semi) but I thought that would be my best option. It’s tough to take a risk in the Semi, because you MUST get a transfer spot. I either run a tire I know I’m not comfortable on in the Main Final and just waste my time driving around for an hour, or take a chance and go for the win! I have practiced a TON on that tire at home and I like the feeling when the track is choppy and edgy. 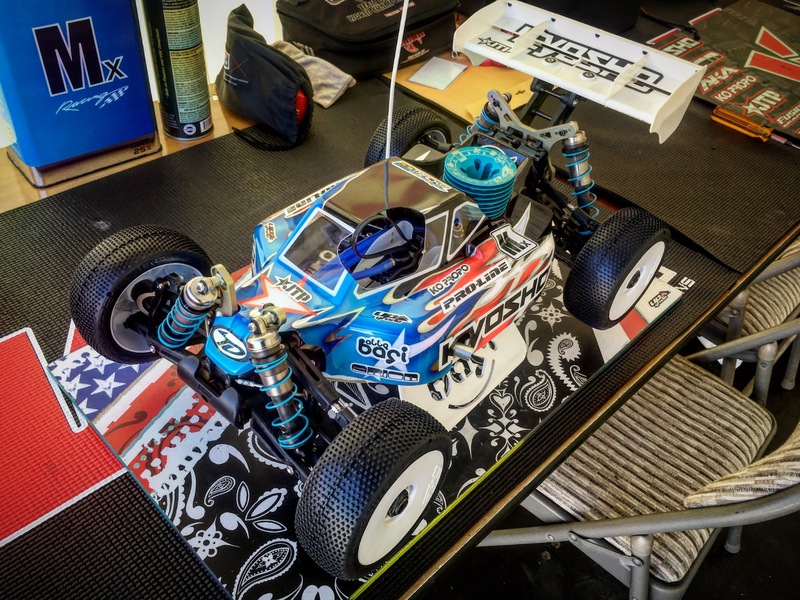 I got my car all ready, fresh Kyosho clutch, charged my Team Orion receiver pack, and bolted on Proline X3 Blockades. I got off to a great start, missing the BIG hole on lap 1 and making passes, moving from 6th to 3rd after the first lap! I was feeling very confident and comfortable with my car and happy with my tire choice. There was a huge battle up front as the top 4 cars made a small break away and tried to pull away from the pack. With the Final being 1 hour, pit strategies were all over the place, my plan was to do 8:30. Boots and Lutz came in at 6, they would do 2 more than me, Ronnefaulk at 7:30, Maifield at 8, they would both do 1 more than me, and then Tessman, myself, and Cavalieri all going 8:30. I’m not sure about Batlle and Ongaro, I wasn’t around them during the first stop. After the second pit stop by David, I took over the lead, and we battled pretty hard at the front. Coming into my 3rd pit stop, David was still ahead of me after his stop, then I made some small mistakes, made my stop, and got passed by Boots and Maifield. That’s when my race turned. Boots bobbled and I hit him, crashing me. I was not happy that I let David get away from me and then found myself battling with more drivers, and I let it get me out of my groove. With the track being so difficult, you could get out of rhythm easily and it might take a few laps to find your pace again. I lost my groove for about 10 or 15 minutes though and then around 40 minutes down, 20 minutes to go, somehow I found myself in 8th place and being lapped by Ronnefaulk. I moved over and let him pass, decided I would follow his lines and see where he was better. I was driving too safe, I saw where he was faster and found my groove again, he was actually slowing me down. He made a mistake and crashed, I got back on the lead lap and just starting pushing hard to catch back up. I had a very strong last 20 minutes, actually putting almost a half a lap distance between myself and Ronnefaulk. I think my tire choice the best of any other Proline driver also, as my speed and consistency was still strong at the end. I did my fastest lap on lap 84 of 95 and worked back up from 8th to 4th at the end of the race. I really wanted the podium and especially the win, but I gave it my all! 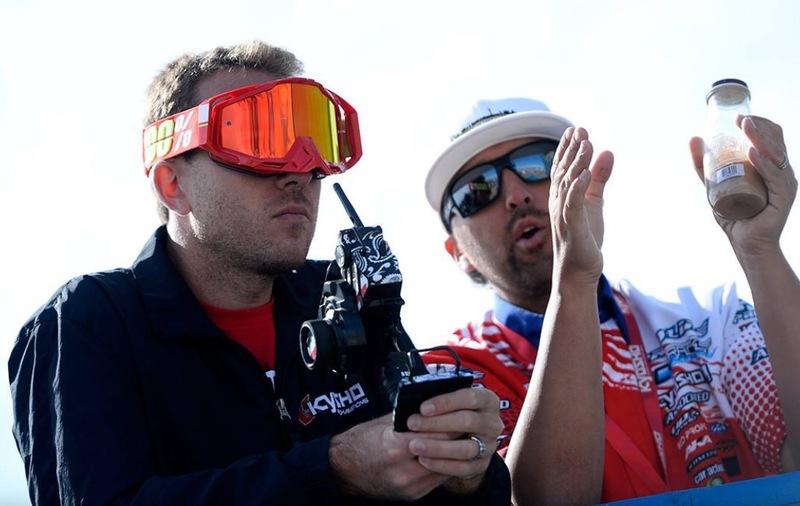 Congrats to David Ronnefaulk on winning his first IFMAR World Championship! Thanks to all the people who came to Vegas to support the event, that was probably the coolest Final I have been in. The entire track was lined with people, multiple people deep, air horns going off, when I fought and took the lead over David, the crowd went crazy, that was really special! 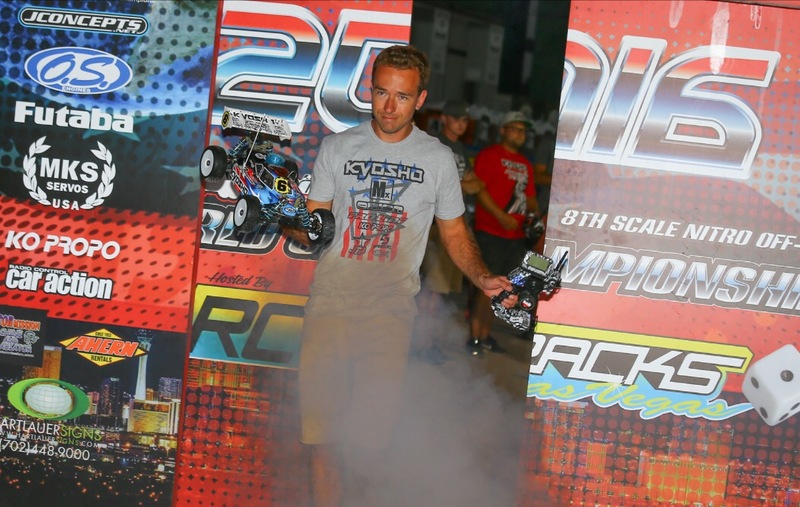 Thanks to Chris Tocco and the whole RC Tracks of Las Vegas crew, thanks to all my fans and supporters! Thanks to Joe Pillars, Rhys Herd, my Dad, all my family watching at home, thanks to my sponsors, Kyosho, MX racing, Team Orion, Proline, KO Propo, Speed RC, JTP, Upgrade-RC, TD Paint, Lunsford, Rock Brook Church, LiveRC.com for the coverage so my family could all watch. Thanks to my Lord and Savior Jesus Christ for blessing me with my career and being able to race for His glory! Already looking forward to 2018 and trying to get the final World Championship I need to complete my collection! See you all at the next race, thanks for reading, God Bless! Hi jared, what setup you used in the final? What is the part number of the front shock tower you used? Did you have to use the optional longer front shock bodies with this tower? What was the reason for using the TKI3 steering knuckles and the TKI3 front suspension mount instead of the TKI4 knuckles and suspension mount? Do you see yourself in most cases sticking with the optional shock tower and TKI3 knuckles and suspension mount? Thanks. The new tower just raises where the upper arm mounts, you also need the new upper arm mount on the rear side of the arm. IFW464 for the tower, and IFW466 for the mount. No, you use the standard front shocks. I don’t like the ackerman feeling with the TKI4 knuckles, as that part was designed more for running the front arm very flat and with all the kickup in the caster block, 19 degree block. I don’t like that feeling and with the normal arm kickup and 13 degree, the TKI3 knuckles feel better. I switch back and forth with the RF suspension mount, higher speed and higher traction, I like the TKI4, it gives less roll. Less traction, slower tracks, I like the TKI3 mount.